Royal Jelly is a nutritious, milky-white creamy liquid secreted by the hypopharryngeal glands of the nurse bee. With it’s incredibly strong flavor and pudding like consistency, queen bees live only from the substance which accounts for their incredible size, fertility, and longevity. Royal Jelly has many nutrients. It contains 12-13% protein, 12-15% Carbohydrates, 5-6% beneficial lipids, including important fatty acids, and contains a full spectrum of vitamins. It is also high in Vitamin B pantothenic acid, which has been shown to reduce stress levels. 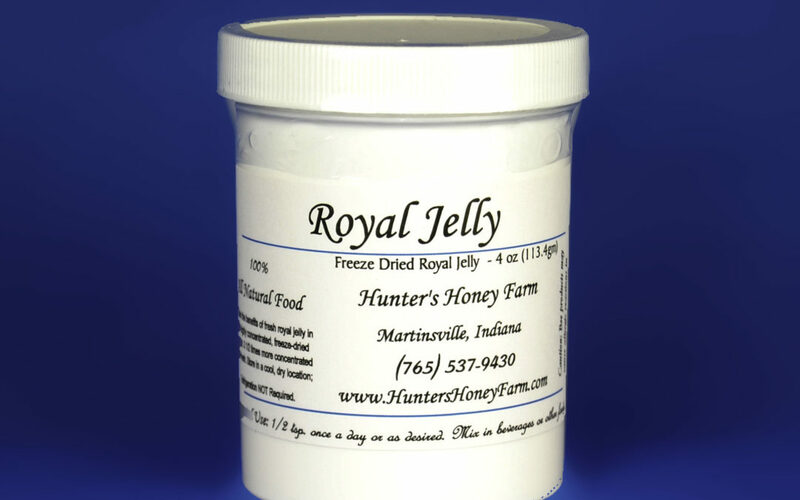 Royal Jelly supplies the minerals, calcium, copper, iron, phosphorous, potassium, silicon, and sulfur. It also contains sterols, phosphorous compounds, acetylcholine, estrogen, testosterone, progesterone, 17 amino acids, including the 8 essential amino acids and is particularly rich in cystine, lysine, and arginine. “Royal Jelly is known to aid in liver disease, pancreatitis, insomnia, stomach ulcers, kidney disease, bone fractures, skin disorders, and as a potentiator for the immune system.” (Prescription for Nutritional Healing: Balch) It has been shown to contain antiseptic, antiviral, antimicrobial, and antioxidant properties. Studies report that royal jelly fortifies centers of the hypothalamus and normalizes metabolic process and improves the base metabolism. Many other reports indicate that royal jelly strengthens the immune system, increases resistance of fatigue and cold temperatures, elevates content of hemoglobin in the blood and stimulates blood circulation. “All the water-soluble vitamins of the B group are found together in royal jelly,” writes Dr. A. Saenz of the Pasteur Institute in Paris. The secretary of Agriculture, Livestock, Fish and Food of Argentina reports that royal jelly aides in the proper transmission of nerve impulses and the proper functioning of the endocrine system. After years of specific research in the field of athletic performance, a team of Italian experts have combined a series of highly invigoration and non-doping natural substances (including royal jelly) to enhance the performance of athletes. “These substances are an authentic ecological fuel” for athletes, preventing them from suffering from psychological and physical stress or depleting their reserves of energy. Another team of Japanese researchers gave royal jelly to one of two groups of Laboratory mice before transplanting different types of cancer cells in them. The royal jelly had no effect on the leukemia cells, bit it had a dramatic effects on sarcoma cells. The lifespan of the mice was extended by one-fifth and tumor sizes were about half the size, compared with the untreated mice.